Creating embroidery designs for clothing has always been a challenge. Most embroidery designs are stitch intensive, which results in designs that are often too thick to properly stitch on clothing. Knitwear is always the most challenging. T-shirts and sweatshirts are usually thinner and the obviously have stretch to them which makes stitching any design over 10,000 stitches feel like a patch. What do you do if you want beautiful embroidery on knitwear? 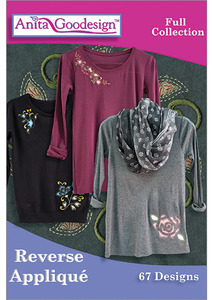 The answer is here, Reverse Appliqué! This technique combines beautiful running stitch embroidery designs with your favorite fabrics. We call it Reverse Appliqué because the fabric goes behind the knit from the back of your hoop and is tacked in place. One the fabric is tacked in place you finish the design by cutting away the knit revealing the fabric underneath. The end result is stunning and lightweight. You can use cotton or knits as your decorative fabric. This collection contains dozens of designs both large and small to decorate your clothing.